Spray 3- to 4-quart slow cooker with cooking spray. In cooker, gently mix thawed meatballs, pasta sauce and peppers. Cover; cook on Low heat setting 6 to 8 hours. Place 2 cheese half-slices on bottom half of each bun. Spoon about 5 meatballs and sauce over cheese on each. Sprinkle each with about 1/2 teaspoon basil. Cover with top halves of buns. Looking for more meatball sandwich ideas? 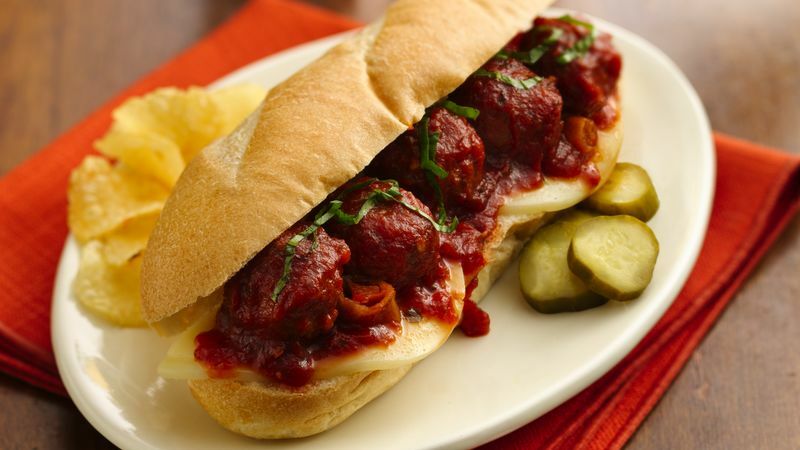 The recipes for Toasted Mexi-Meatball Hoagies and Italian Meatball Subs can be found on Pillsbury.com. Pepperoncini peppers, also called Tuscan peppers, are a variety of chile pepper with a slightly sweet and spicy-hot flavor. They are most often sold pickled.